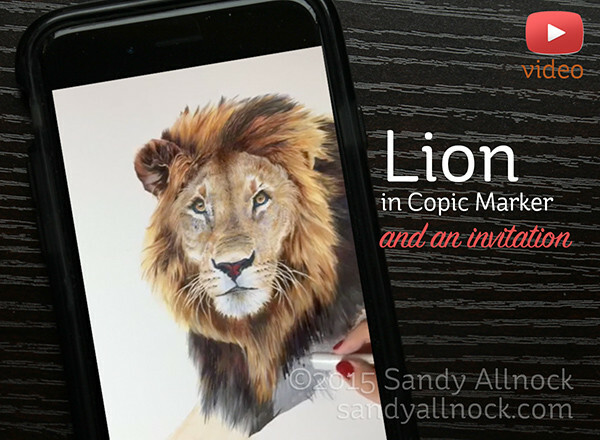 Today’s short video is a way-sped-up version of this lion, created mostly on Periscope broadcasts. I’ll be hosting an all-day art session on Thursday October 29th, and I hope you’ll pop in to visit! Watch the video below or click HERE to see it in HD on YouTube. I hope you can join me next Thursday….I’ll be on Periscope all day working on something. Yet to be determined. But it’ll be fun, whatever it is! Download the app on itunes or google play and follow @sandyallnock to be ready! That’s it for today….short & sweet as I do a little recuperation from not feeling so hot. 🙂 happy weekend! You know that lion is amazing and your talent is enviable right??? You are one amazing artist! My skill set is light years below yours, but watching your videos always encourage me to try product, style and techniques unknown previously. Thank you for being so uplifting and willing to share all that you know. I love your work. Please come down to San Diego and visit the zoo… And teach a class or two; we’d love to have you. No smart devices here, but I’ve enjoyed checking in on the katchme. Your Wild Eye lion is incredible. You are one multi-talented gal! Mind BLOWN. Amazing work, Sandy! Watched parts of this on Periscope and I am totally in awe of your mad coloring skills. You did a perfect job of capturing how majestic these animals are! Sandy here is a link you may be interested in for a live stream safari drive that happens 2x daily, every day from South Africa. Beware though, you may get hooked! http://www.wildsafarilive.com. It also streams on YouTube and Ustream. Thanks for sharing this – simply stunning! Just stunning Sandy! Hoping maybe I can break away from work for a bit and sneak in to finally see you on periscope next week. enjoying the tutorial; where did you get the lion outline? Loved watching your Wild Eye Lion come alive under your skilled hands. Amazing! What an inspiration. Good Grief Charlie Brown – your lion is ALIVE! Such talent. Awesome!!! Get some rest and have a quick recovery. Absolutely stunning!!! Par for the course for you tho! Oh my godness. What an amazing artist you are!! This is the most beautiful drawing with copics I have EVER seen. It is absolutely lifelike. Take care. Hope you feel better soon. I love the your art pieces. 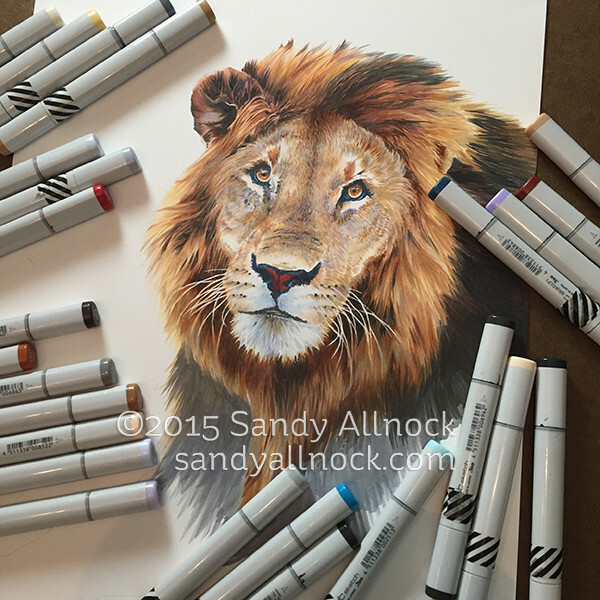 My son is going to be two soon loves lions and he would love seeing this. What a great subject, I also loved the Panada’s you shared on Instagram. My kids love wild life shows any time you post an art piece on Instagram with animals I get a great reaction when I show it to them. Thank you so very much for the stunning lion. I truly love learning the possibilities and testing my boundaries. It’s been fun watching this lion come to life. No periscope for me due to no smart device (and being at work), but I’ll have to try to catch the replay. Hope you’re on the road to recovery. You can watch online live.